When I first heard about this sequel to ‘Crossed’ I was sceptical. I figured ‘Crossed’ to be something that would not, could not be done – how do you follow up on something as grossly unique and sick as Crossed? Well, it has been done, minus Garth Ennis and Jacen Burrows, and all I can say is WOW. If anything, the intensity, fear, gore, terror and depravity of humans and the ‘Crossed’ is more pronounced, more keenly felt in this terrific drama from David Lapham – yes, David Lapham, recently of ‘Young Liars’. He has done Ennis’ creation proud, with a barnstorming opener that manages to fit in family drama at its rawest, a siege, and, of course, the ‘Crossed’. My god they are a terrifying, awesome enemy. 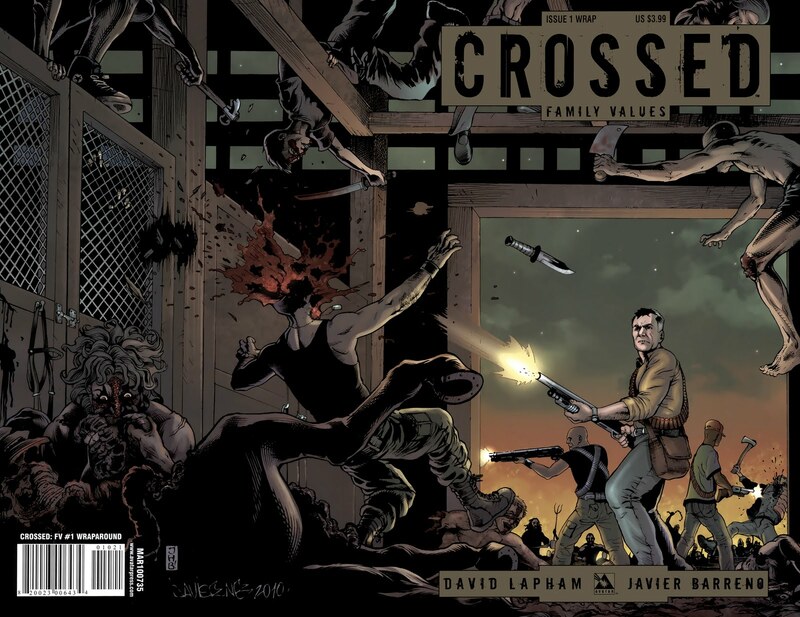 The art, by Javier Barreno, fits in well with the Jacen Burrows stylings of the original ‘Crossed’, and that is not meant as a slight. His art is brilliant in its staging, it capturing of the everyday and the apocalyptic. If you were a Crossed fan, I don’t need to tell you that you need to give this a try. If you are a Lapham fan, try it, but be prepared to be more shocked, as this is no ‘Young Liars’- it is much more ‘out-there’. For the rest – if you think of your worse nightmare, of vivid, bloody, needless slaughter, of desperate struggle and a nihilistic, darker-than-dark atmosphere pervading everything….well, if you want to read that in comic form, dive in! ‘Crossed Family Values’ #1 is out now. It is not easily forgotten, and it has me hooked. This could be something I did not expect to say, but this could easily outstrip the original ‘Crossed’ in terms of quality, drama, terror and excitement.